You have probably seen pictures of Machu Picchu in books but seeing it in person is more surreal and expansive than I had imagined. To give you a sense of how large it is, it took us over 2 hours to walk through it. I can see why it is one of the 7 wonders of the world. To get to Machu Picchu, you will most likely start in Cusco, Peru. Cusco is a highland city at over 11,000 feet above sea level. From Cusco, you will take a 20 minute ride to the train station. From there, you will take a slow train 57 miles to Caliente, Peru. To see a slide show of pictures from our trip, click here. Yep, I said it was slow — 57 miles on this train takes 3.5 hours. We got there early (6:00 a.m.) and they served breakfast on the train. The view along the way to Machu Picchu is very good. Once you reach Caliente, Peru, you hop a bus for a 30 minute ride up to the top of the mountain that is Machu Picchu. The bus driver drives like crazy through switch backs with no guard rails — not for the faint of heart! Once you reach the top, you then hike several hundred feet to the very top to get your first awesome peek. At the top, we met our Guide who told us the Incas built it at the top of the mountain making it easier to watch out for attackers. As we descended towards the first structures, we encountered the only gate into the colony. During Inca times, it was always open unless there was a threat of enemies, then it was closed with similar sized boulders. Once you enter the gate, you get a sense of the pride of workmanship. They were great architects even though they never had a written language. 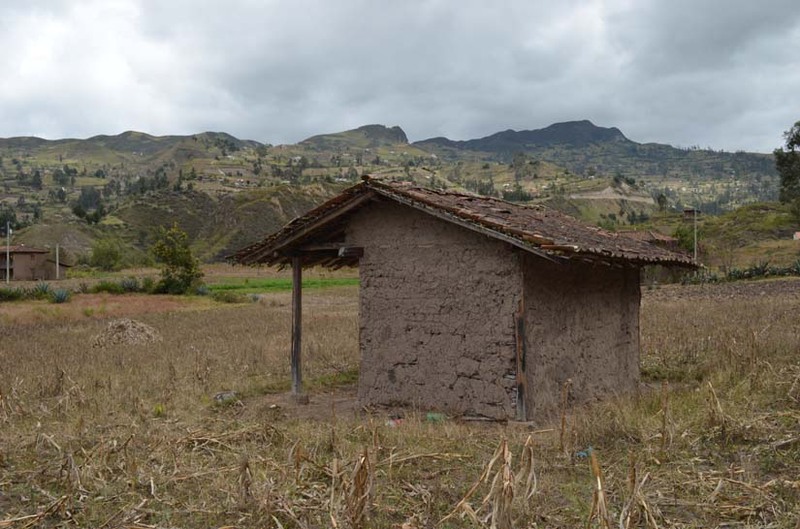 Even without a written language, the Incas taught their young how to build, farm, and protect their colony. 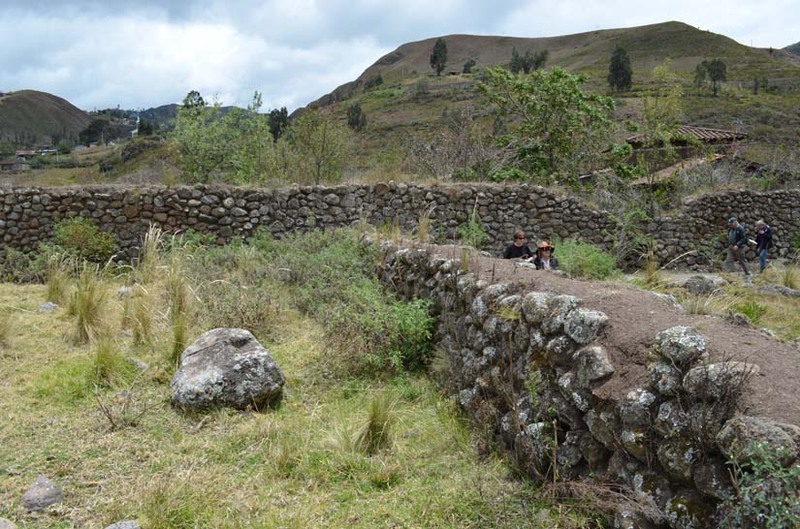 The walls were much higher than the ruins show — most walls were about 30 feet high during the Inca rein and they laid each stone without winches, machines, or saws. Only Inca nobility lived in Machu Picchu. Peasants lived in the low lands in Adobe homes. Bedrooms contained beds made of stone — these were filled with alpaca fur, straw, and handmade blankets. By the way, alpaca was a delicacy for the Incas and I had a chance to eat some for dinner. It was very good, tasted like beef. High priests spent much of their time in the Temple of the Sun, a beautifully built rotunda. Notice the intricate rounded sides of the temple and how each stone was cut and laid without any mortar which relied on exact sizing of each stone. As you traverse through the colony, you see areas of crops and trees that were used for food by the Incas. Everyone in the colony paid taxes. They did this by working 2 months of the year for the colony and they could work the other 10 months to feed their families (hunting, farming or protecting the village). Young boys hunted and fished for 2 months, girls learned to weave blankets and hats, men carved and carried rocks to make the village, and women weaved for their taxes. The Incas had 3 rules (do not steal, do not lie, and do not be lazy). If you violated any of these 3 rules, you would be publicly beaten. If the offense was really bad, they would lock the person up in jails made by the Inca. If an Inca betrayed the colony by giving enemies information on how the colony lives (or jeopardizing their security), they would lock the person up in solitary confinement and put snakes and spiders into the cell, killing the traitor. As you can see, Inca were very adept at farming. They terraced the mountain so that they could plant on level land and prevent erosion. The Inca were said to have had 10 years of crops harvested and stored to combat hard times. As you can see, we really enjoyed our trip to Machu Picchu. If you ever get the chance to go, take it! To see a slide show of pictures from our trip, click here. After we left Machu Picchu, we flew to Miami on our way to the Bahamas but Hurricane Sandy had different plans for us. Our flights were cancelled so we stayed 3 nights in Miami — not a bad place to be stuck. We stayed ocean front in South Beach and had a great time. We are now on our way to the Bahamas for 3 weeks of relaxation. This entry was posted in Our Travels, Peru, Travels to South America on November 2, 2012 by smiller257. This was our last week in Ecuador, we had a great time in the 6.5 weeks we spent here. We are now off to Machu Picchu for a week and then to the Bahamas for 3 weeks to “unwind” from our vacation. Would you like to buy your software from Microsoft or Markosoft? Hell Kitty or Hello Kitty? Finally, I thought Hudsons was purchased by Marshall Fields. Guess it tells you how much I know — they just went south to Ecuador! We also noticed that you can purchase movies on DVD for a buck. A buck, really? How do they do that? Well, I guess pirating movies here is a really big business. They have DVD stores on every corner with the latest releases for a buck. The movie studios must just be cringing. Hey, consumers love it — similar to using Redbox for a buck but you get to keep the movie! In our final week here in Ecuador, we visited Ingapirca — probably the best Inca ruins in Ecuador. They were impressive. The Incas were similar to the Romans in that they wanted to dominate the region and they did for many years. They occupied territory that is now Chile all the way up to Columbia and created the Inca trail that tied their territories together. 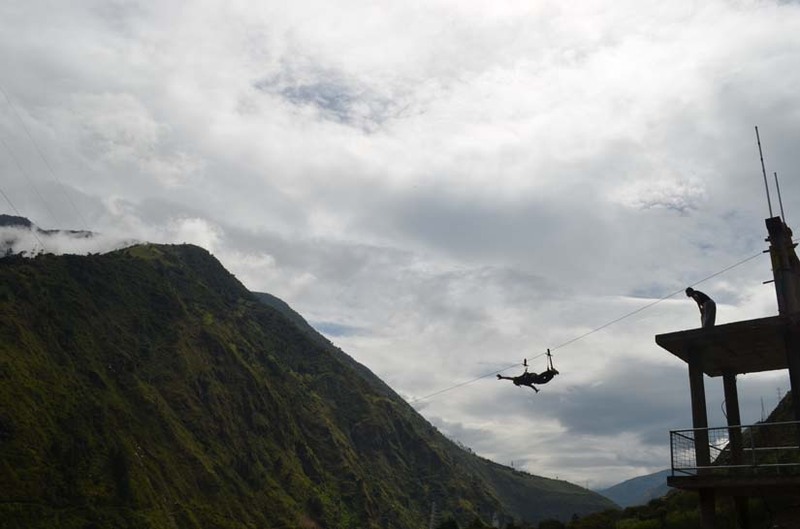 The Inca trail spans over 2,000 miles. Ingapirca was one of the last areas they spread to by taking over lands previously occupied by the Canas. Ingapirca was built in the highlands with incredible views of the valley. Here are some pictures, but they don’t do it justice, you really should visit! While we were visting the ruins, we captured on video an Andean band playing native Andean music. Click the picture below to see the movie. Very cool! This entry was posted in Ecuador, Our Travels, Travels to South America on October 26, 2012 by smiller257. ?No hacer creerme? Yo tranduco la frase arriba. Nosotros pasomas manana dormemos tarde, comemos daysayuno y visitamos museo nueva cada dia. OK, if you know Spanish I may have just butchered that but I think the main point gets across. This week we were walking around to a museum and happened on to this Indian group playing indigenous music. We noticed that they were dressed very similar to Native American Indians, which seemed odd to us because we see indigenous Ecuadorians every day and they do not dress this way. Our Spanish teacher said that it was not original dress, but the music they played was authentic. Interesting! One of the coolest museums we have visited is the Banco Central. 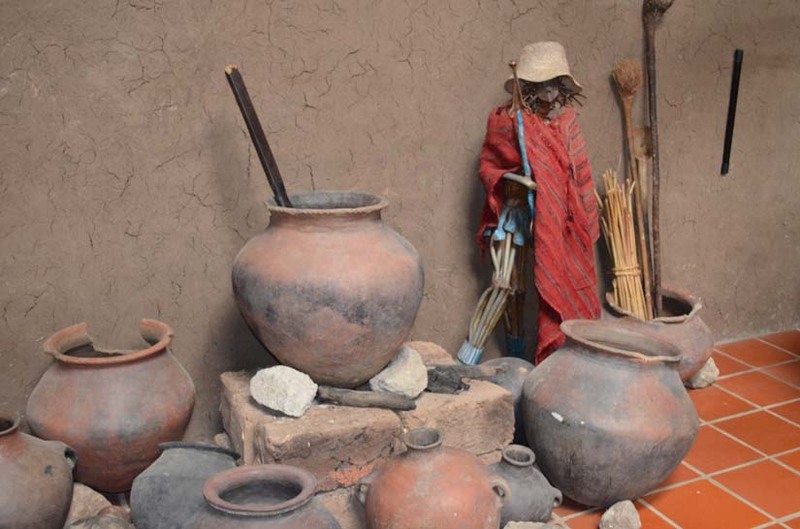 It has an inside museum of indigenous artifacts but also is built on some old Inca ruins. Behind the ruins are some impressive gardens. In the gardens are fields of indigenous crops. Next to the gardens is a pond full of fish that is inhabited by ducks and other birds. We also visited one of the many Panama hat factories this week. These hats have always been made in Ecuador but are called Panama hats because when the Panama Canal was being built, they ordered tons of hats due to the hot sun and rain. Since they were being worn so often there, they were dubbed Panama hats. Panama hats are made the old fashion way. It takes 2 days to make a single hat (the ones that cost between $25 and $250) and 6 months to make really high-end hats that cost $1500. Once the hats are weaved, they use machines to press them into different styles. Lynn tried to talk me into buying one but I just don’t think I am a hat guy. What do you think? Yep, that’s what I thought! I did not buy one! Next week is our last week in Ecuador, then off to Machu Picchu and then the Bahamas. Hasta Luego! This entry was posted in Ecuador, Our Travels, Travels to South America on October 19, 2012 by smiller257. 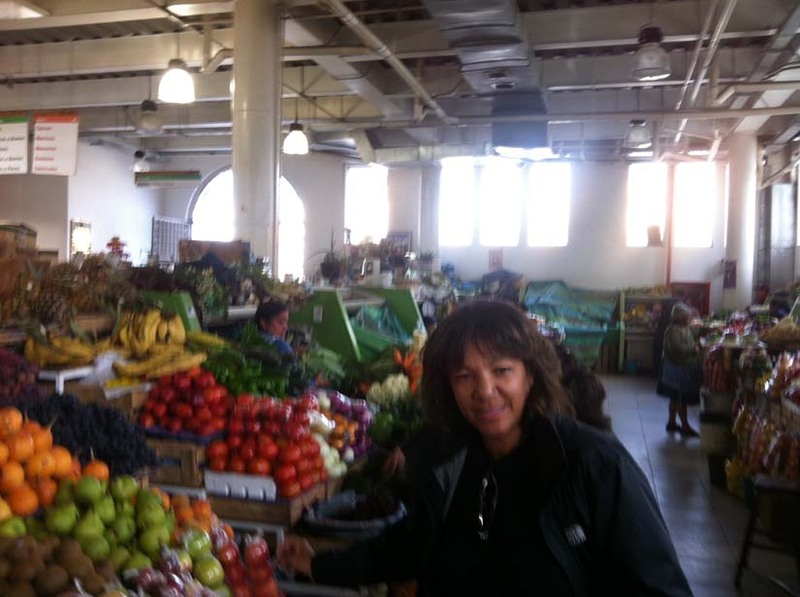 After luxuriating in Banos, we decided to travel south to Cuenca Ecuador to study Spanish and to experience why many Gringos (non-Ecuadorians) have been calling this town “the retirement haven” of Ecuador. Any of you that have watched Househunters International will probably recognize Cuenca. In our minds, it is the exact opposite of Quito. Quito is very historic yet we found it to be crowded, dirty and not very beautiful. Cuenca, on the other hand, is surrounded by beautiful green mountains and it is clean and tranquil. To see a slide show of pictures we took in Cuenca click here and Chobhi click here. 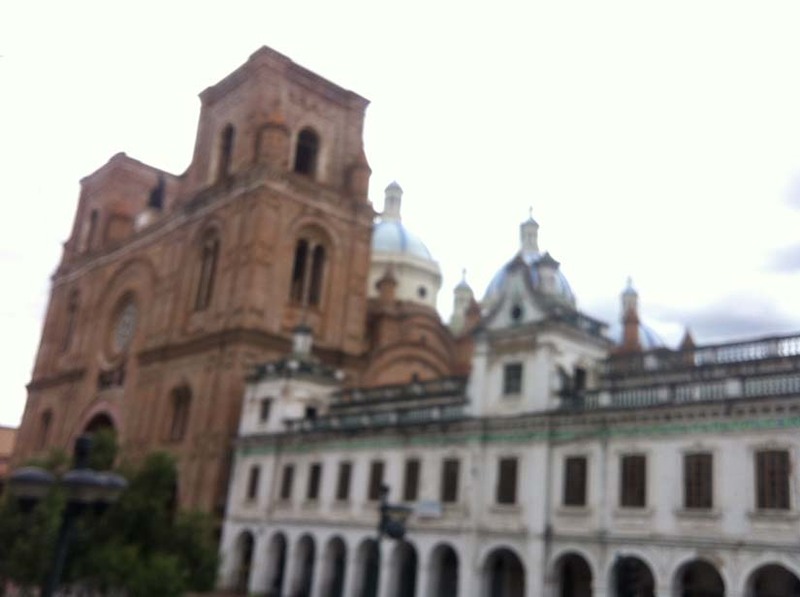 Cuenca is an older city (the Spanish settled it in 1557) and has about 500,000 residents, yet it feels very small. In 2009, Cuenca was voted the most attractive place to retire and there are now about 4,000 Gringos retired here. The allure is cost of living and moderate climate. They have a really well supported expat community with several weekly meetups where you can meet other Americans, Canadians, and Europeans that have settled here. On our first night, we learned of a Gringo meetup at restaurant “DiBacco Bar“. 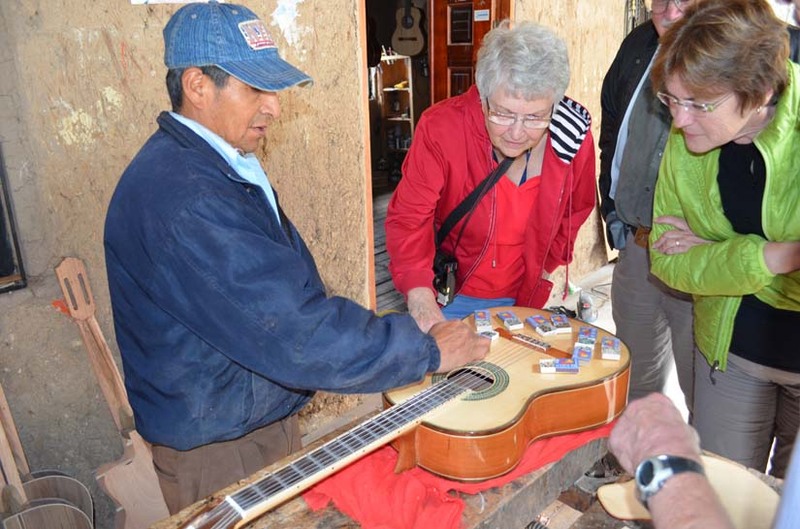 Lynn and I went and met about 20 Gringos that have retired here. Since then, we have seen them all over town. We went to a local Gringo hangout (called the Inca Lounge) to watch American football last Sunday and we saw many of the same people we had met at DiBacco Bar. Cuenca is cost-effective. For example, we went to an Italian bistro and ordered 2 pizzas (about 10 inches each), a salad and 2 very large beers and paid a total of $12. Most people rent apartments for $300 to $500 per month. We are renting an apartment for 3 weeks complete with a flat screen TV, washer and dryer and kitchen for only $43 per night. Many people say they live on $1,200 to $2,000 per month comfortably here. The climate is pretty much the same all year around because it is situated close to the equator. It averages about 50 degrees as a low and 72 degrees each day as a high. That is a pretty big swing in temperature, so most people wear a light jacket every day. Since we have been here, it has been hot and sunny in the mornings and cloudy most afternoons. There is almost no humidity due to it’s 7,500 feet altitude. I am told there are 2 seasons, rainy and dry — we are just entering the rainy season now, which is why it is cloudy in the afternoons. For me, I prefer having 4 seasons and I enjoy the hot summer days and crisp winter days we enjoy in Florida. Lynn and I have taken some Spanish classes in the past (Lynn more than me) so we wanted to expand our Spanish knowledge. We have decided to spend almost 4 weeks in Cuenca and attend daily Spanish classes 4 hours per day. We are now 1.5 weeks into the classes and I have to say we have increased our conversational abilities already. When you are visiting a country where few people speak English, you really have to adapt and hold conversations in their native tongue. Otherwise you will not be able to hail a taxi, get a hotel room or order meals. I am surprised at how well we have adapted with the little Spanish we know, but it has forced us to do it which has been great. “buenos dia / buenas tarde / buenas noche” (good morning, good afternoon, good evening). 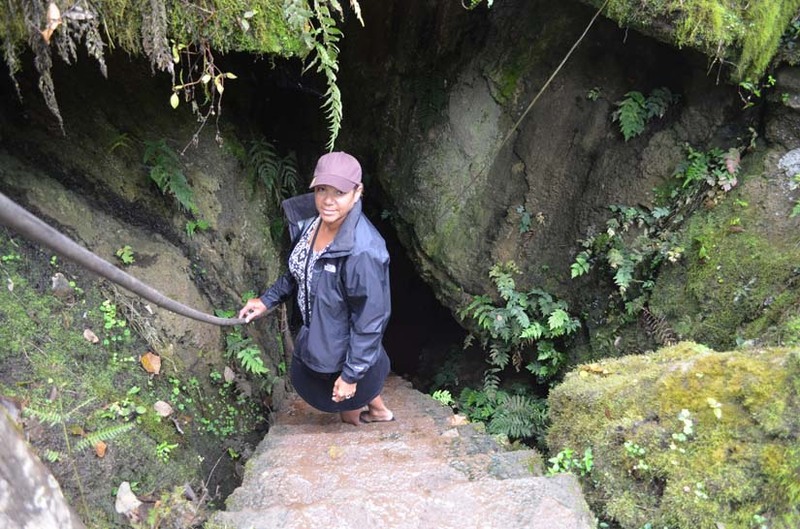 Last Saturday, we took a tour of the caves of Chobshi. This is about 2 hours east of Cuenca and is very interesting. Dating back to 8050 BC, the early inhabitants of this town were nomads that moved from place to place looking for food and animals to hunt. They lived in caves and made ceramics (plates, vases, etc.). They also make weapons for hunting and protection from invaders (spears, axes, tools, and arrow heads). 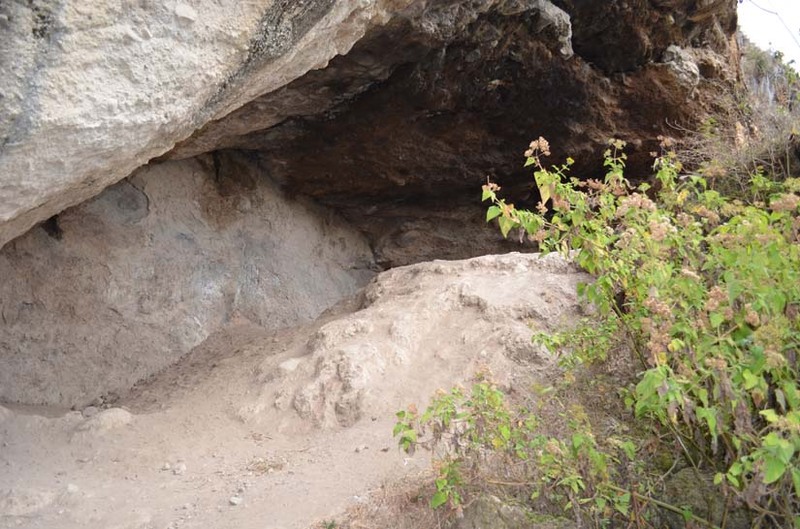 In Chobshi, the caves are still intact from that time period and they have excavated many ceramics and tools from the site. To see a slide show of pictures we took in Chobhi click here. Later (around 1500 AD), the Incas took over this area and you can see the ruins left behind. The ruins were where the Incas lived, worked and held court. In 1557, the Spanish conquered the Incas and replaced most of the Inca buildings with colonial Spanish buildings, which are now present. They are built with Adobe (bricks made from mud, manure and straw). The indigenous people still build their homes this way. When we were in Chobshi, we saw many people making adobe bricks and living as they have for many generations. 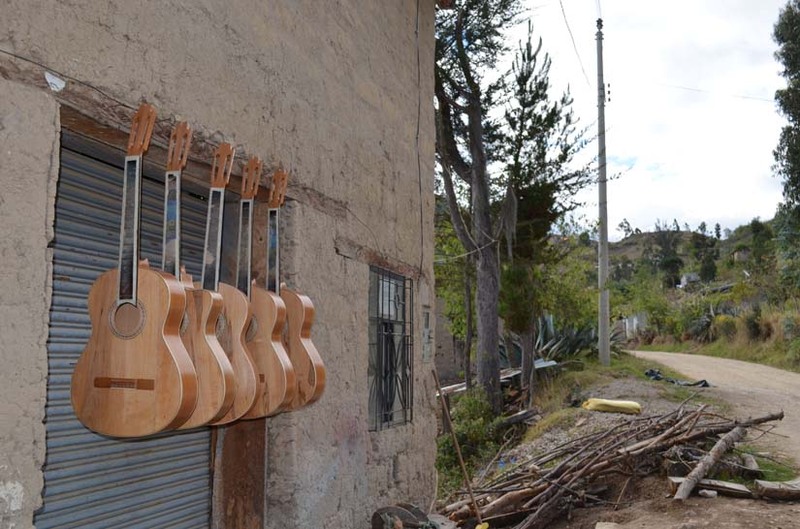 On our way home from Chobshi, we stopped by a family that specializes in hand-made guitars. These guitars are really impressive and have lots of details with great workmanship. I really wanted to purchase a guitar for my dad and my brother, but I knew there was no way we could continue our travels while lugging 2 guitars around. The cost was very reasonable (ranging from $150 to $250 each). Shipping goods from Ecuador is a bit suspect (they may or may not make it to the intended recipient) so I was afraid to purchase and ship them. We are planning a lot more tours while we are visiting Cuenca so we will share some of those over the new few weeks. After leaving Cuenca, we will visit Machu Picchu, then hang out in the Bahamas for about 3 weeks. 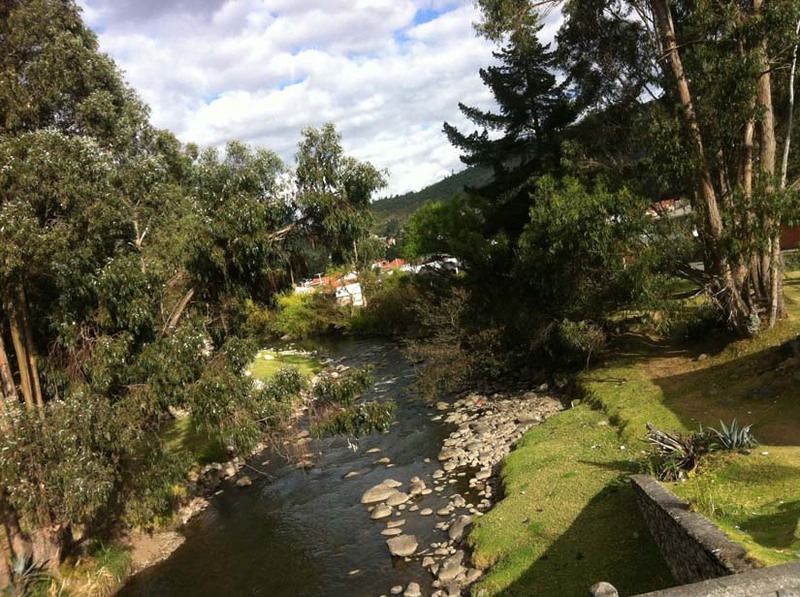 This entry was posted in Ecuador, Our Travels, Travels to South America on October 12, 2012 by smiller257. 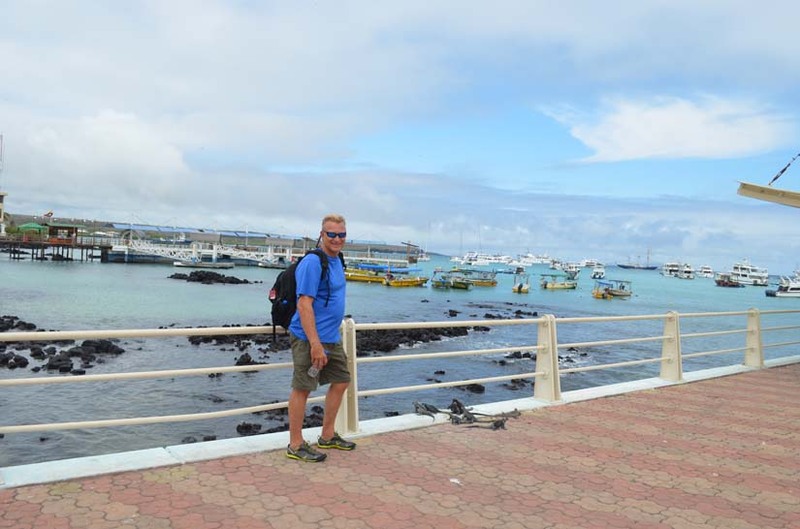 We have returned from our two-week trip to the Galapagos, flying back to Quito. 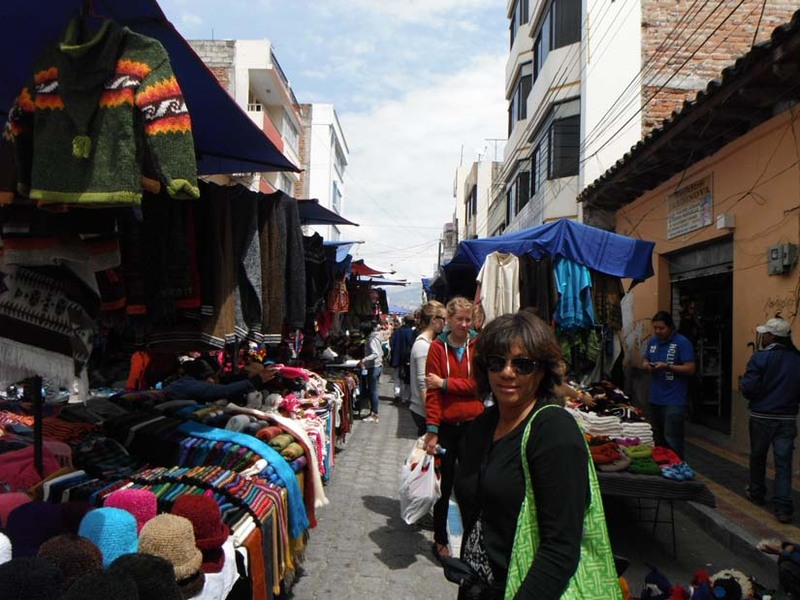 From Quito, we decided to spend Saturday in an indigenous market in Otavalo, Ecuador. This is where all the indigenous people come each week to sell their wares. Otavalo is located about 2 hours north of Quito. We took a bus there for $2 each — it was a nice bus with a flat screen TV showing the movie Mission Impossible. To see a slide show of pictures for our Banos trip, click here. We enjoyed our day at Otavalo and decided we wanted to have a few days of rest and relaxation. Banos is a city about 3 hours bus ride south of Quito. So on Sunday, we jumped on a bus ($3.50 per person each way) and made our way to Banos. Banos is well-known for its hot springs and massage shops (legitimate massage). It is set in a beautiful setting, about 8,000 feet above sea level surrounded by incredible huge green mountains. One of the big attractions of Banos is its massive number of waterfalls. We enlisted a local taxi driver to give us a 4 hour tour of the waterfalls and a tour of the city — all of this cost us about $35 (he wanted $22 but we tipped well). The first stop of the tour was a huge canyon (about 2,000 feet deep) that had a waterfall driving into the canyon. As you can see, they have a cable car that you can take over the canyon. But even more fun, they have a zipline that you can take over it. When ziplining, you can elect to zipline normally or Superman style. Of course, I elected to go Superman style! The zipline is very long and about halfway through the zipline, it starts bouncing like crazy! Then when you enter the end of the route, you come in very fast and it looks like you are going to hit a rock wall but a 14-year-old boy snags the zipline just feet from you crashing into the wall. Quite exhilarating! Once we finished the zipline, we journeyed on to another 8 or 10 waterfalls until we ended up at a waterfall that is only visible by hiking about 20 minutes down a canyon. 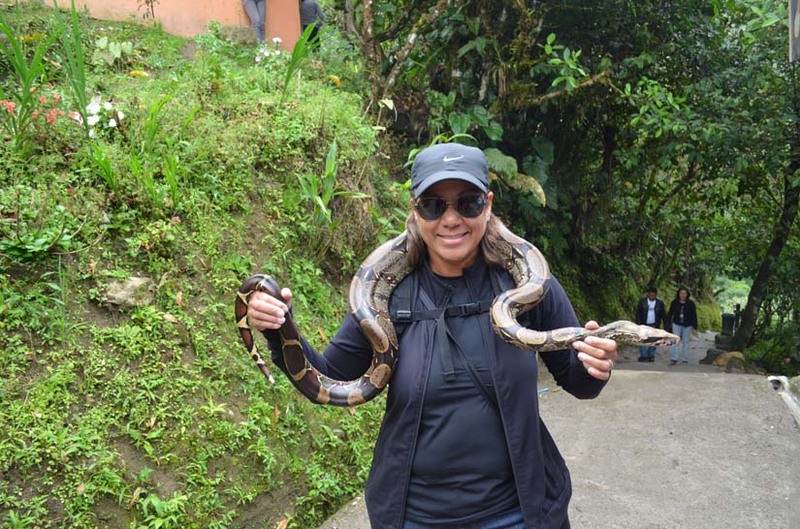 On the way to the waterfalls, we stopped by a vendor that had huge snake you could take a picture with. I hate snakes (as most of you know), but Lynn was brave and put the snake around her neck. You go girl! As we trekked down the canyon for 20 minutes, we knew it was going to be a bear to trek back up. But the view from the bottom was definitely worth it. 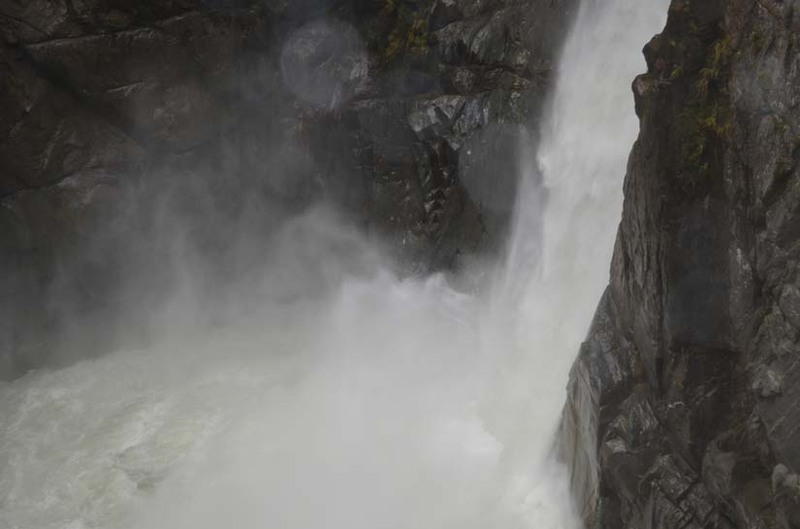 The waterfall gushes down a 240 foot wall and is very surreal to visit. We ended the day by having a wonderful dinner, Skyped with our boys at college and both had a massage. We stayed at this wonderful B&B called Casa Verde. It cost us only $40 per night with breakfast included and it was in a wonderful setting. Outside of our window were beautiful green mountains that allowed you to just relax and take it all in. And the massage was incredible. The massage therapist came to our B&B at 8:30 at night to do it — what great service! And the massage was only $25 for an hour! So our next adventure is moving south to Cuenca, Ecuador. We plan to enroll in a Spanish immersion school where we will take Spanish classes 5 days a week for 4 hours a day. We will probably stay there for 4 weeks so that we can improve our Spanish. Hasta Luego! This entry was posted in Ecuador, Our Travels, Travels to South America on October 5, 2012 by smiller257. We enjoyed our 8 days of sailing around the Galapagos Islands so much that we decided to stick around for another week. So we cancelled our flight back to Quito and decided to explore two more islands, Santa Cruz and San Cristobal. 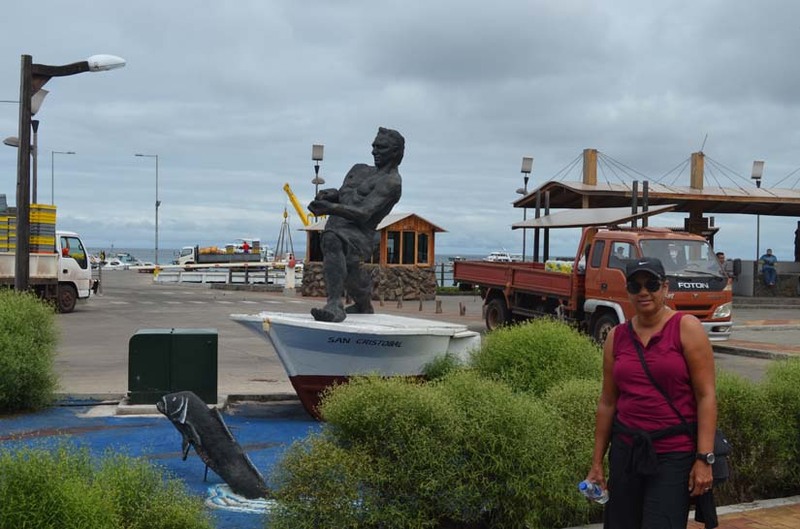 We started our trip in Puerto Ayora in Santa Cruz. This is a port town that offers a cool harbor, the Darwin Research Center, Lava Tunnels, and a pristine beach named Tortuga Bay. As we entered the tunnel, it seemed like they were really tall and we had plenty of room to walk through them. However, after walking through it for a few minutes, we found that we had to body crawl Marine style to get under some of the points of the tunnel. 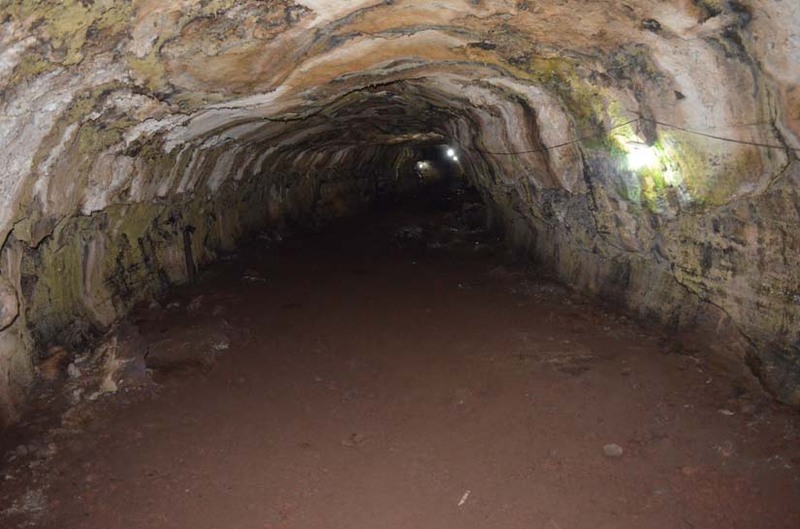 To make it worse, we wore flip-flops — not the best choice for rocky areas of the tunnel. So I am still trying to live this down since I convinced Lynn to do it! On the last day of our visit to Santa Cruz, we trekked to Tortuga Bay. It is about a 45 minute walk to a really pristine beach. The beach reminded me a lot of the beaches in Panama City Beach, but it did have sea lions — something we obviously do not have in Panama City. We wanted to spend a few days on San Cristobal island, so we purchased a ticket on a speed boat for a 2 hour ride from Santa Cruz to San Cristobal. We loaded up the boat with over a dozen passengers and started to pull off. Then to our surprise, another boat pulled up beside us and began unloading his cargo into our boat. As they started loading these crates, we started hearing incredibly loud chirping sounds. They had loaded 1,500 baby chickens into our boat and they took the 2 hour ride with us! 1,500 baby chickens made a very loud noise. click here to see the video. San Cristobal is a sleepy port town, we took this opportunity to unwind and just enjoy a few days without tons of activities going on. They have several beaches on San Cristobal, but they are totally overun by sea lions. You can even see them on the town benches. It is illegal to harm the sea lions, so they get their run of the town. San Cristobal has an Interpretive Center that I think is more impressive than the Darwin Research Center. It does a really good job of explaining how the Galapagos Islands were created and what groups of people have inhabited the islands through the years. On our hike to the Interpretive Center, we stopped by a small beach. We saw this sea lion resting on a set of kiyaks, thought it was very interesting. We really enjoyed this week in the Galapagos. We are now off to Quito where we plan to take a day trip to Otavalo, a place where indiginous people put on a weekly market to sell their wares. 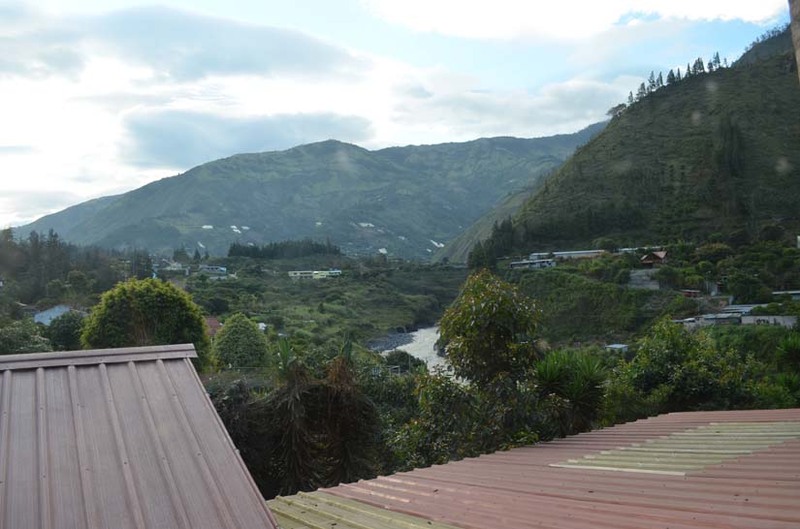 After that, we plan to spend some time in Banos, Ecuador. 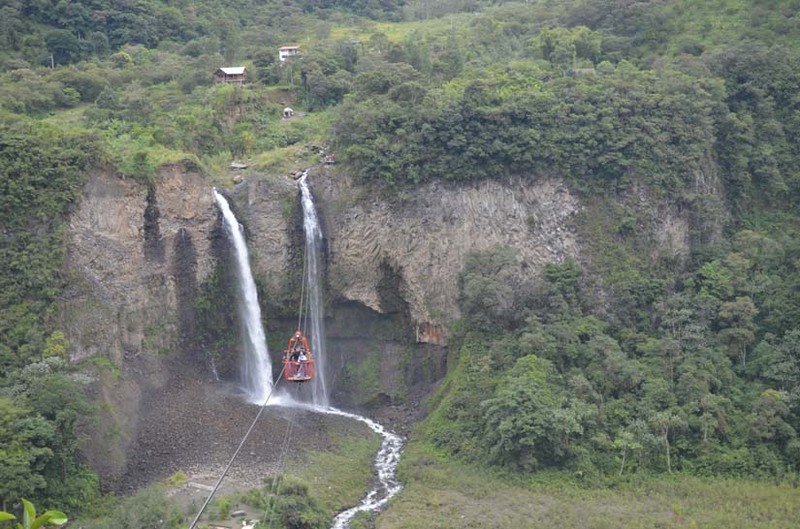 Banos is a relaxing place with beautiful waterfalls, ziplining, and incredible massage therapy houses. This entry was posted in Ecuador, Galapagos, Our Travels, Travels to South America on September 28, 2012 by smiller257. Stunning. Surreal. Natural. Beautiful. 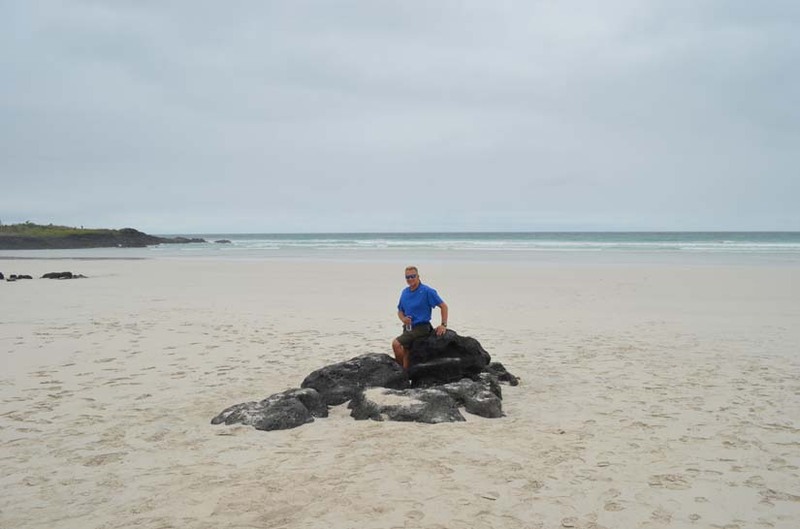 It is hard to articulate the beauty of the Galapagos Islands, it is really a gem of a place like no other. We took an 8 day cruise on a 16 passenger yacht around the northern Galapagos Islands. This trip took us to 5 islands filled with all kinds of wildlife. We saw crabs, lobster, many birds (boobies, Darwin finches, frigate birds, and more), sea lions, sharks, dolphins, whales, huge land tortoises, sea turtles, marine iguanas and land iguanas. For those of you cracking up – yep I said boobies. Red footed, blue footed and nasca boobies, birds that take to the air. I am now officially a boobies man! 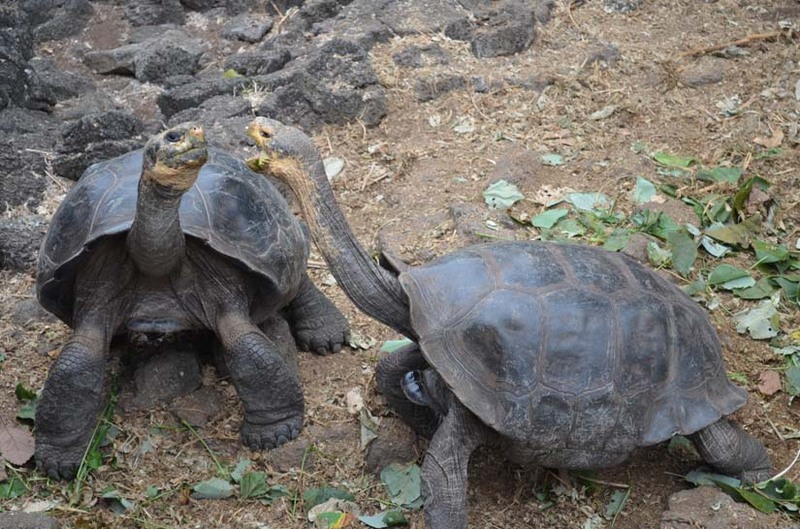 If you wish to see a photo slide show of our Galapagos trip, click here. When we boarded the yacht, the first thing I noticed was a different type of bird flying overhead. It had a 6 foot wing span, crooked beak, and scissor tale — it was a frigate bird. I knew right then we were going to see many species of animals we had never seen before. We spent our first day at a nice beach surrounded with crabs and all kinds of birds and sea lions. We snorkeled twice and took hikes. We got to know the crew and other passengers on the boat. Many were from Switzerland and we had one other American and a couple from Canada. Great group of people — young travelers really enjoying themselves. There was even a couple with a one year old girl — she was the sweetest little girl you could imagine. Being on the yacht was really cool. The cook was amazing, I don’t think we ever ate the same thing twice and the food was delicious. Each day we had a full schedule, starting at 7 a.m. breakfast, followed by snorkling, hikes, and time to play cards and enjoy the other passengers. We traveled to a new island each night so each morning when we woke up, we saw new and exciting surroundings — and the landscapes were awesome. On day 2, we sailed to a crater style island and had some really great snorkeling. We saw lots of fish, sea lions, and a few sharks. We capped off the day with a beautiful sunset. 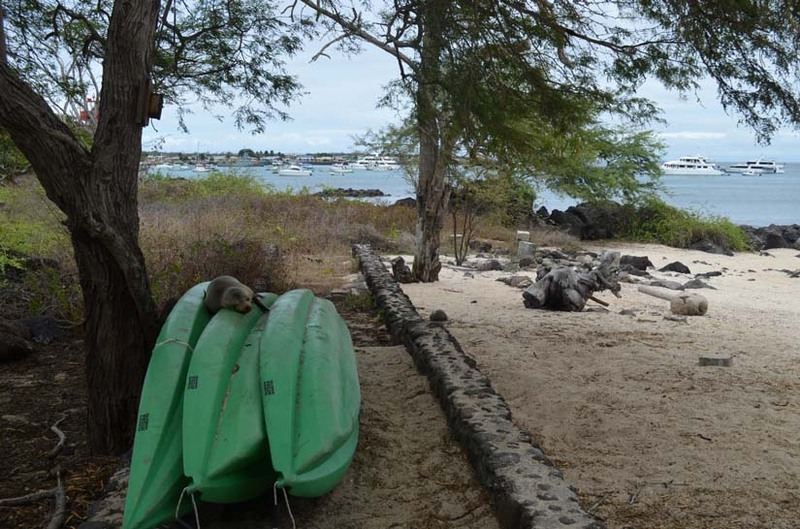 The next day of snorkeling brought us face to face with sea turtles and marine iguanas. I never knew iguanas could swim. Only on Galapagos — they use their tail to navigate the sea. They munch on the sea algae, just as the sea turtles do. When snorkeling, I captured on video one of many sea turtles that we saw: click here to see the video. We also saw the famous land tortoises. They are huge. Really big. We even happened upon a sea turtle getting ready to lay eggs. This is unusual for this time of year, the guide said he had never seen them do it before. So it was pretty special. It takes about 5 hours for them to dig a hole with their hind legs, lay the eggs, then cover them up with soil. Very cool. During our trip, we saw beautiful landscapes everyday. We took over 1,000 pictures, these are just a few that don’t even do it justice. 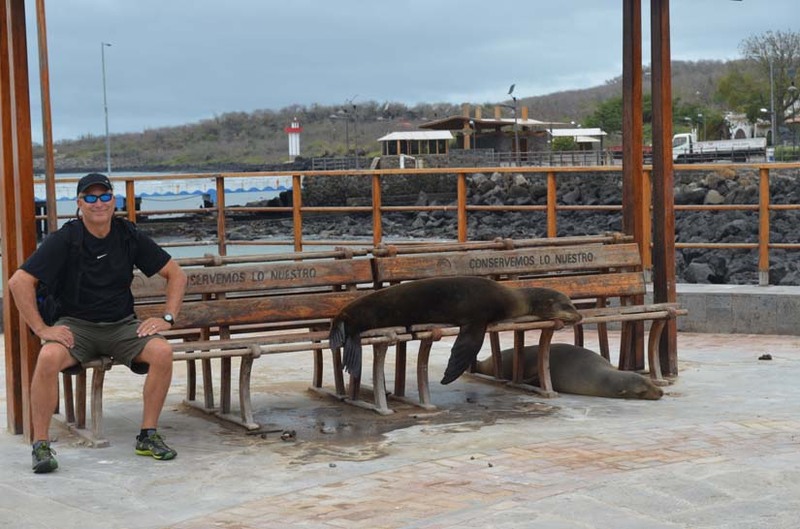 We saw lots of sea lions while in the Galapagos. They are very curious animals, they want to come up to you and play. Check out this video of a cute sea lion we saw: click here to see the video. On the last day of our trip, we came upon 2 alpha male sea lions fighting. This is not seen very often. I took a video of it: click here to view the video. This entry was posted in Ecuador, Galapagos, Our Travels, Travels to South America on September 21, 2012 by smiller257. 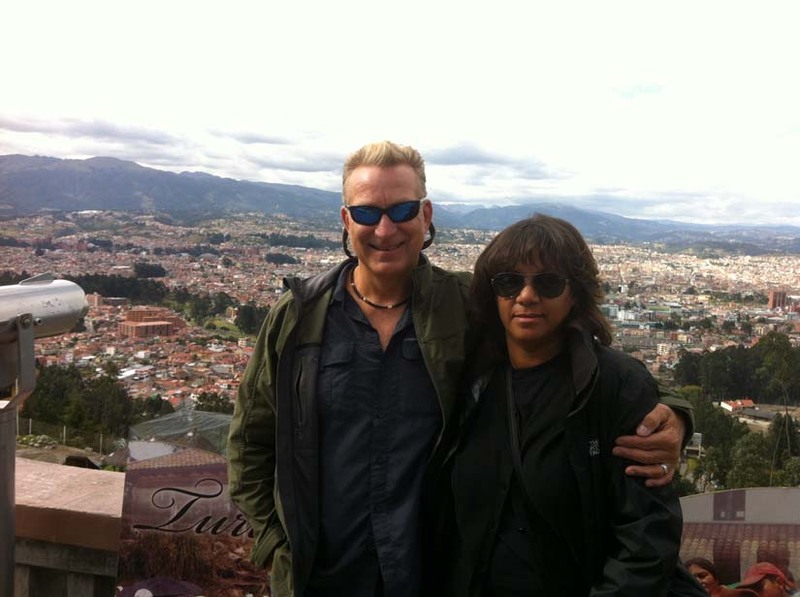 On our way to the Galapagos Islands, we stayed a few days in Ecuador’s capital, Quito. Quito is a highland area, its elevation is 9,350 feet. Even though we lived in Denver, Colorado for 14 years (5,280 feet), we found ourselves getting tired quickly and experiencing headaches. But we did not let that detour us from getting out and exploring the city. We booked a city tour, which was about a 6 hour tour that showed all the highlights of Quito. If you visit, I suggest you do the same, as Quito is a very large city — spans almost 30 miles and has 1.5 million residents. Quito is an old city and certainly shows it’s age. It has some beautiful Spanish architecture, but like many large cities, it has become dirty and sports a lot of graffiti. But we certainly enjoyed our short stay here. 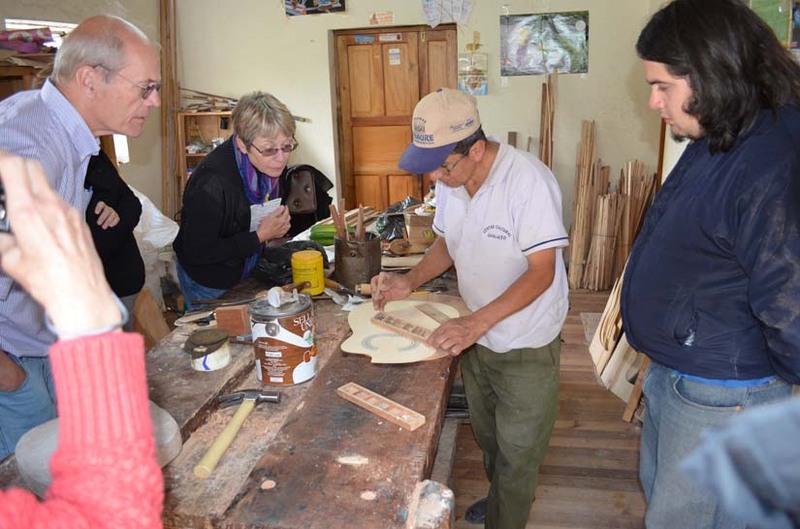 If you wish to see a photo slide show of our Quito trip, click here. We started our tour visiting the statue of the Virgin Mary. She has a dragon at her feet and is said to protect the city from volcanoes. Quito is built around a volcano — so I can see why they needed this protection! We then traveled to La Rhonda, the first area of land settled in Quito. La Rhonda is supposed to mean “walk around”, as many people who lived here in the early days liked to take walks after eating. Quito has many churches and beautiful plazas. Most of the population is Catholic. It was also very cool to see some of the indigenous people walking around in their best dress. Everyone in Quito was very friendly. Lynn and I are beginners in the Spanish language but was surprised at how well we managed to ask for directions, order food, and make small talk. 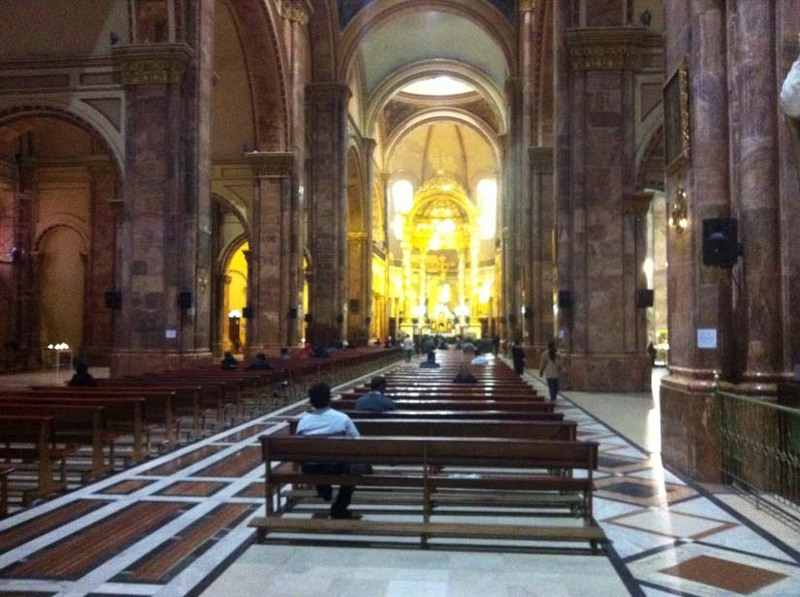 We also visited the stunning Basilica del Voto Nacional, this is a very large church, built in a Gothic style. We were able to go into the church and climb stairs up to the top of the towers where it afforded us an incredible view of the city. We ended our tour by visiting the center of the earth. Quito Ecuador is located at the very center of the earth (0 degrees longitude). They showed us some cool events that happen. If you pour water into a sink while sitting on the center, it flows directly down without any swirling. If you step a few feet to the Northern hemisphere, the water drains with a counter-clockwise swirl. Step a few feet into the Southern hemisphere, the water drains with a clockwise swirl. I was shocked that it happened right in front of us! This entry was posted in Ecuador, Our Travels, Travels to South America on September 14, 2012 by smiller257.